Victor Vasarely was the founder of the Optic Art or Op Art movement. His studies at the Budapest location of Bauhaus education in the 1920’s influenced Vasarely style of geometric abstraction. 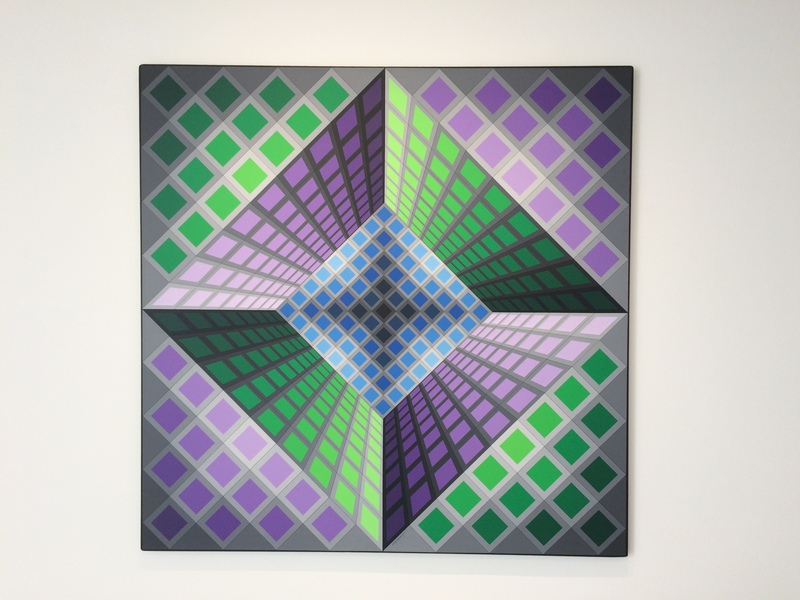 The paintings in the “Analog” exhibition at Maxwell Davidson Gallery demonstrate Vasarely’s ability to visually bend and stretch the plane of the 2-D canvas into 3-D space. The images seem to bounce and vibrate off the canvas. The acrylic painting “PHOBOS” from 1979 uses the distortion of squares to create what looks like a square-shaped hole in the center of the canvas that is angled at a 90-degree turn from the edges of the canvas. The four isosceles right triangles in the corners of the canvas feature a pattern made up of purple or green squares. The four isosceles trapezoids have been filled in with distorted representations of squares creating the perspective of falling inward or protruding outward. The central square contains a grid of squares that again flattens out the plane. Vasarely was the master of painting exacting geometric formations, but the most impressive element to this work is the exciting sense of space and movement. This is the first gallery show of Victor Vasarely’s paintings in many years It was very exciting to see a great selection of these geometric masterpieces all in one location.